This is what my Sultan Center hauls look like when I’m not shopping on an empty stomach (lawl). I just picked up a few sachets of Nescafe (spotted here) to try to find a new favorite instant hot drink and some Tortilla Chips and Salsa (always craving the stuff). I visited both the Souq Sharq branch and the Promenade branch of Sultan Center on separate days during the month of September, but decided to group them together for this post. Basically, I keep running out of either the Chunky Salsa (Medium) or Tostitos Hint of Lime Tortilla Chips (which is all I’ve been craving recently). As long as it’s not Hot (which makes my nose run, eyes water, ears turn red, tongue swell up and lips feel like they’re on fire) nor Mild (which is tasteless), I’m not picky about which brand of Salsa I get. My only prerequisites are that it’s Chunky (with veggies) and Medium (has a kick to it), which is generally easy to find at any branch. 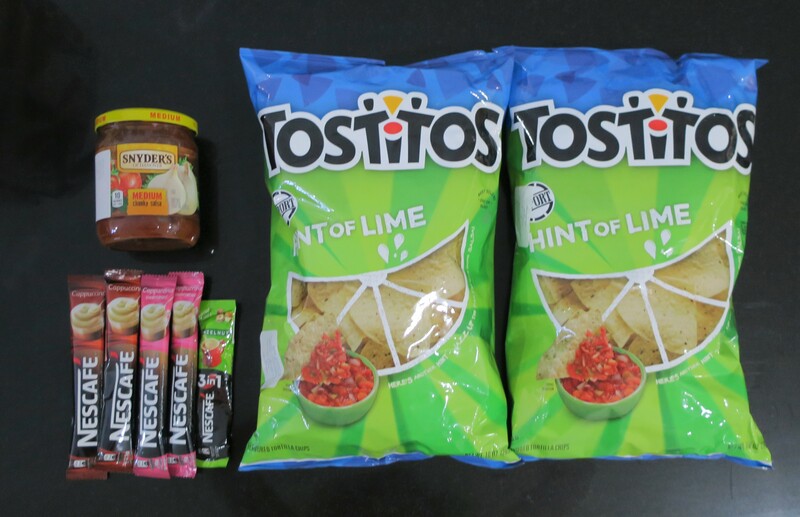 Sadly, the Tostitos Hint of Lime Tortilla Chips are less easy to find (they appear in and out of stock at random), which is why I’m always on a scavenger hunt of sorts (because I never know if they’re in stock or not) at Sultan Center. With that being said, I’m happy to report that I spotted those delicious Chips Ahoy! Brownie Filled Chocolate Chip Cookies (reviewed here) in all the branches! I didn’t get any, because like I said, I’ve only been craving Tortilla Chips and Salsa recently. However, it’s nice to see the Chips Ahoy! Brownie Filled Chocolate Chip Cookies available in large quantities. Plus, Chips Ahoy! even partnered up with Microsoft to come up with a little promo featuring one of the games (Sea Of Thieves) on Xbox One. I’ve never heard of that game before, but still, what a fun idea!